HAVE YOU BEEN INVITED TO EDEN? 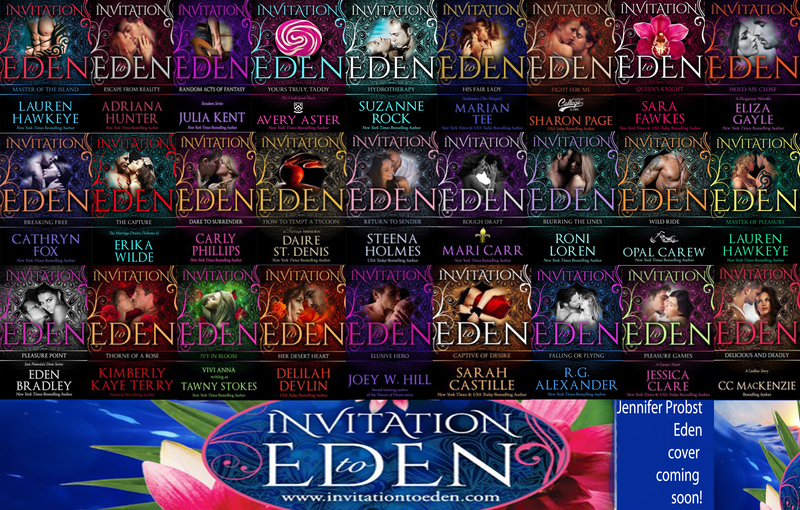 I am so excited to be part of the INVITATION TO EDEN Series with 27 of the hottest authors in romance. What is Eden? It’s a book series set on a mysterious island located somewhere in the Bermuda Triangle. Each month we will be releasing three books set on the island, where anything and everything goes. We’re kicking off the series with an awesome FREE prequel, MASTER OF THE ISLAND, by Lauren Hawkeye – read it here…Master of the Island. CHECK OUT OUR INVITATION TO EDEN WEB PAGE! JOIN OUR BOOK CLUB TO DISCUSS THE STORIES AND ENGAGE WITH AUTHORS! SIGN UP FOR OUR NEWSLETTER TO FIND OUT WHEN THE NEXT BOOKS ARE COMING OUT! CHECK OUT OUR FACEBOOK PAGE FOR UP-TO-DATE INFORMATION ON THE SERIES! UNRAVELED BOXED SET IS LIVE!! I am soo excited to be a part of this incredible boxed set. UNRAVELED features all new material from eight bestselling authors! 600 pages- you save $22.93!